Last week was Back To School Week at r/Retrobattlestations. The challenge was to photograph your vintage computer running an educational program of some sort. For this one, a rather obscure little app that I ran across when first loading up the NeXTstation that I acquired in 2000 came to mind. FlyLab by Robert Desharnais of California State University, Los Angeles. It is a genetics application that visually conveys inheritance through mating pairs of flies with configurable traits, sort of a fly construction set. The app really stood out for me because it is an ideal demonstration of what NEXTSTEP could bring to education, and its interface a model of the strengths of the NeXT Interface Builder development tool. Desharnais and Melvin Limpson of the American Physiological Society developed a variety of NEXTSTEP applications as part of CSU’s Virtual Courseware Project, funded by CSU as well as major grants from the National Science Foundation (NSF). In response to an email I sent at the time of my Back To School Week submission, Desharnais shared a bit of history surrounding FlyLab. A portion of his email follows. FlyLab on NeXTSTEP was my first major app written for that platform. I did create a few more NeXTSTEP educational apps before NeXT went under. I love your NeXTstation! Brings back fond memories. FYI, FlyLab begat a number of progeny. 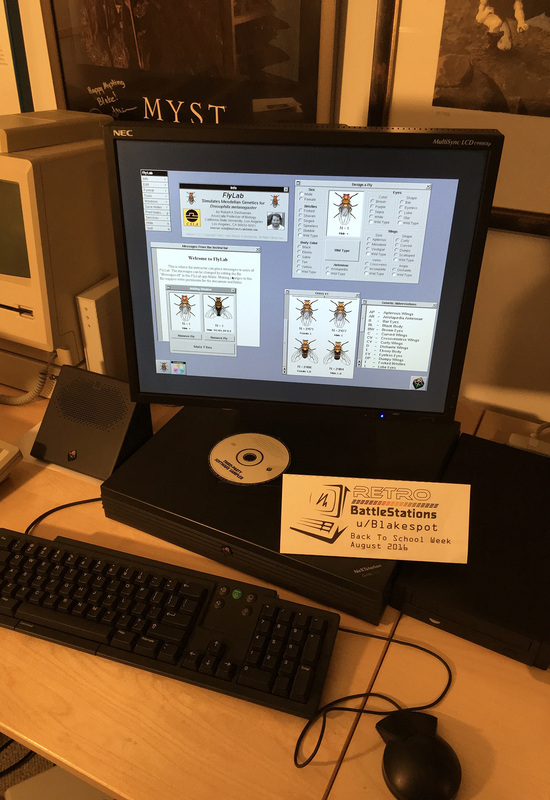 It’s son, Virtual FlyLab was a web-based server-script that went online in July 1995 and was very popular. In 2001 Virtual FlyLab begat a Java version called FlyLab that was part of a commercial product (Biology Labs OnLine) marketed by Pearson Ed, but is now available on our servers for free. Then came the great-grandchild called Drosophila, also free, which was developed using Flash and has lots more bells and whistles. Drosophila is currently being used in lots of colleges and high schools. The app bred like, well, fruit files. It’s nice to hear the backstory of this little app that stood out to me way back when. I have searched online and cannot find an FTP archive hosting FlyLab, but will dig through my NeXTstation’s filesystem and try to find the original archive I downloaded (sixteen years ago…) to post shortly. It does little to bolster my personal illusion of youth to realize that my early retrocomputing endeavors are, themselves, becoming retro. This entry was posted in NeXT, r/Retrobattlestations, UNIX and tagged application, education, NeXT, university. Bookmark the permalink. Hey Blake, I was just browsing an old Byte mag online yesterday, trying to find for how much the Commodore64 was being sold for in December 1983, down from his release prize the previous Xmas (from US$ 595 to $230, the highest price I found, and $165 when bought in a package with a 1541 drive and printer/monitor), and I was amazed at how many, and how diverse, application software was available for the Apple II and especially the IBM PC. And I thought how many of all those apps are already lost. You see, some people are actively buying and asking for donations of old VHS and Beta tapes recorded at home, in the UK, to be able to extract Teletext/Ceefax information that was encoded alongside the audio and video signals, thus being recorded on the tapes… So I think that when we buy an old computer, we should try to rescue the software inside them, try to check if it’s already preserved, before formatting the drives and disks. Interface Builder is so awesome. I used it at State University in the 90s. I have the same NeXT pizza box you have, but no monitor. Is that monitor a 1990SX? Can the monitor scale the desktop to fit edge to edge?